DatacenterDynamics Converged 2014 has offered again a radiography of the latest trends in Data Processing Centre and all the areas that compose them. 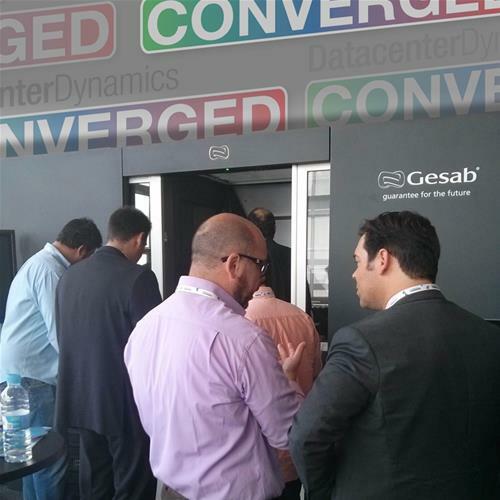 GESAB, as a market leader, attended with its solution CCNOC cold corridor enclosure, a combination of technology, functionality, versatility and design that caught everyone’s attention by the solution provided in the field of datacenter. – New technological trends like Big Data, Internet of things, total accessibility from any device at any time or cloud computing, are becoming an increasingly palpable reality. But these trends are inexorably linked to sustainability, as it has become a key indicator for any large company. – The energy efficiency of datacenters has improved markedly in recent years, especially thanks to increased awareness and changing vision for innovation. You can always create new solutions, even just changing the way in which certain operations are performed or making changes in the system so that maximum efficiency is achieved. – For fluid dynamics, was presented as a possible solution for datacenter performance, analyzing its current implementation, the emerging use in the operations phase and predictive possibilities of this technology in the near future. – Certification of datacenter goes a step further with Tier IV GOLD, which takes into account not only the design and construction but elements relating to the maintenance and sustainability are also included. Currently there are only 3 DPCs in the world with this certification. No doubt the event lived up to expectations and innovative solutions that companies should consider for their next projects on Data Processing Centre.